‘…we at Rend Collective have a confession to make. We are not actually an indie-folk band- despite all the beards and bow-ties and banjos. We are a celebration band. It’s just a coincidence that folk music and celebration make a great pairing! …[Our records are] an attempt to reflect something of the irrepressible laughter in the heart of God. It’s a call to the cynical to once again choose celebration over condemnation and a reminder to the broken that ‘the joy of the Lord is our strength’…’ Rend Collective. Quite possibly one of my favourite bands/artists to come out of the U.K./Ireland area, alongside Tim Hughes, Matt Redman, Philippa Hanna and the now disbanded Delirious?. Originally signed to worship music label Integrity Music before making the jump to Capitol CMG and thus releasing the chart-topping more radio-friendly 2015 album As Family We Go (which featured the radio singles ‘You Will Never Run’, ‘One and Only’, ‘Every Giant Will Fall’ and ‘Joy of the Lord’), Rend Collective have managed to fuse together two things and do both of them well- present to us great worship music, while also pushing boundaries and creating good acoustic/folk/alternative music worthy enough of having repeat value, with their craft on a higher plane than sadly most of the modern worship music available at our fingertips at the moment. Not to discount the valid passion present in much of today’s CCM/worship community, it’s just that when a band/artist comes along that presents to us something different (and it’s a different that is great), we all ought to sit up and take notice. And Rend Collective is one such band. Fusing together musical similarities from artists/bands like Delirious?, Leeland, All Sons and Daughters and Crowder; Rend Collective have always been honest and earnest with their songs. And while they are currently on Capitol CMG, it was their former years at Integrity Music that solidified them as one of today’s most heartfelt worship groups, able to bring to us songs full of heart and hope, pain and suffering, yet equal moments of reverence and awe. It is in that spirit of remembering and nostalgia that Integrity Music as a label have decided to release a 14 song ‘Mixtape’ if you will, of all their biggest hits spanning across Organic Family Hymnal, Homemade Worship for Handmade People and The Art of Celebration. While at face value these 14 tracks may seem a little small in terms of representation of three great albums of Rend Collective’s past, yet when we look deeper, we can see that within these 14, we have been given great songs that have touched the lives of millions over the years. While I know that this album may seem redundant (if it is not re-recordings) with the advent of Spotify in particular, this project is a must have for anyone who hasn’t heard much of Rend Collective before and want to start on a project that encapsulates the best of Rend Collective’s earlier years! This review isn’t really much of an expose as such- I’m sure that anyone who is interested in this Rend Collective mixtape would be those who are collectors and want the album for ‘adding to the Rend Collective collection’ or people who just want to have a casual listen to a long-standing worship career, and thus, would just simply put on the CD in the car. What I will say is this- encompassing the 3 albums the band has released from Integrity Music, I say that the mix of song representations from each is fair, and in fact, very well balanced when you have to consider that there’s only 14 songs that ought to cover the best-of-the-best from three albums. Songs like “You Bled”, “Faithful”, “Exalt” and “Movements” are the representatives from their first album, and while it probably would’ve been nice to slot it a song like “Come On” into the definitive mixtape, I’d have to say that “Come On” probably wasn’t as popular or even as radio friendly as the aforementioned four. Nevertheless, a great representation. Homemade Worship By Handmade People, for me arguably their strongest album to date (yes, even more cohesive than As Family We Go), is shown a lot of favour and grace, with songs like “Praise Like Fireworks”, “Alabaster”, “Desert Soul”, “Build Your Kingdom Here”, “You Are My Vision” and “Second Chance” all added into the 14 track list- that’s 6 songs from their 2012 album- the most out of the 3 albums. The Art of Celebration adds in the remainder 4 tracks to make the track list up to 14 (Joy, My Lighthouse, More Than Conquerors, Boldly I Approach), and while I probably reckon songs like “Simplicity” and “Burn Like a Star” ought to have been added- but only if the track listing was extended from 14 to let’s say, 17 or 18; what is the strong point is that for what limitations the album was given (a set number of songs on the album, thus causing the label to make choices about which songs to include in the best-of and which songs to leave out), the overall song selection on Build Your Kingdom Here is in fact spot on if you have all things considered. A first time listener to the band (or someone who is familiar somewhat but not that much) will be pleased with this project, and hopefully, they will decide to hear some more songs of this unique and poignant band. 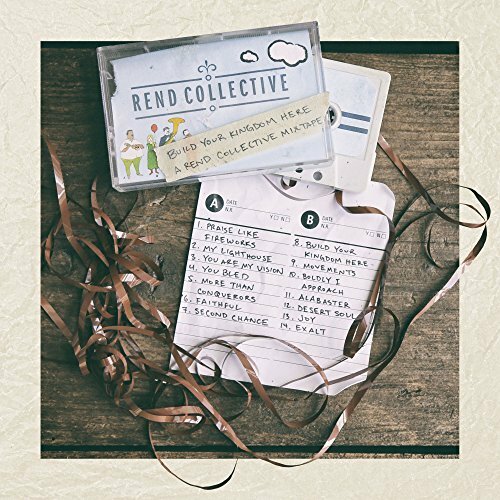 Rend Collective have continued to place emphasis on their strong lyrical content, which is still considerably true on this best-of 14 track mixtape project. Their strong lyrical prowess, and their unique instrumentations that set the band apart from any other worship band of today, is what makes the band special. And while they dropped their name ‘experiment’ a few years back, the band are still utilising their inimitable plethora of instruments to provide us all with powerful music and poignant lyrics as we reflect upon the songs of their past that have made them who they are as artists- songs that they will indeed be remembered for, in years to come. From the emotive ‘More than Conquerors’, which speaks of the boldness of following Christ, as we remember that we are indeed conquerors in Christ, and heirs to the throne, to the reimagining of “Be Thou My Vision” titled “You are My Vision” alongside a song that I reckon should’ve been a radio single but unfortunately wasn’t (“Boldly I Approach”); this 14 track album is one that’ll be the most appreciated if you enjoy the modern alternate worship music genre, along the same musical lines of David Crowder, All Sons and Daughters and Leeland, or if you haven’t really heard much of the band and want a well-balanced snapshot of popular songs throughout the band’s earlier part of their music career. Along with Bluetree and Delirious? ; Rend Collective is yet another band from the U.K. area whose influenced has reached across globally. With continual support in the U.S.; this is a band that will continue to reignite the passion of worship with their unique and different aspect on how worship should be and be delivered to those who hear it. A sense of realness and authenticity is created that will intrigue listeners to hear the songs from this amazing band. Well done guys for such an inspiring and enriching best-of project. Here’s to the future and to all the great songs as the years roll on! Kudos to the band! Can’t wait to the follow-up to As Family We Go whenever it arises!